A man who carried out a mock hanging of a man-sized golliwog doll while wearing a Ku Klux Klan costume has pleaded guilty to a charge of stirring up racial hatred. Christopher Philips, formerly known as Darren Clifft, 23, from Willenhall, will be sentenced on 19 December. 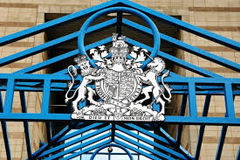 Wolverhampton Crown Court heard the hanging happened at an event in Wales in March. He was arrested after he posted three videos of the mock hanging on YouTube. Philips pleaded not guilty to a second charge of stirring racial hatred, which will remain on file after a request from the prosecution.